This article is about the horse-drawn carriage used by long-distance passenger transport operators. For other uses, see Stagecoach (disambiguation). A stagecoach is a four-wheeled public coach used to carry paying passengers and light packages on journeys long enough to need a change of horses. It is strongly sprung and generally drawn by four horses. Widely used before steam-powered rail transport was available a stagecoach made long scheduled trips using stage stations or posts where the stagecoach's horses would be replaced by fresh horses. The business of running stagecoaches or the act of journeying in them was known as staging. Familiar images of the stagecoach are that of a Royal Mail coach passing through a turnpike gate, a Dickensian passenger coach covered in snow pulling up at a coaching inn, and a highwayman demanding a coach to "stand and deliver". The yard of ale drinking glass is associated by legend with stagecoach drivers, though it was mainly used for drinking feats and special toasts. The stagecoach was a closed four-wheeled vehicle drawn by horses or hard-going mules. It was used as a public conveyance on an established route usually to a regular schedule. Spent horses were replaced with fresh horses at stage stations, posts, or relays. A simplified and lightened form of stagecoach, known as a stage wagon, mud-coach, or mud-wagon, was used in the United States under difficult conditions. These were the vehicles that opened up the new stage routes in America's West. In addition to the stage driver or coachman who guided the vehicle, a shotgun messenger armed with a coach gun might travel as a guard beside him. A stagecoach traveled at an average speed of about 5 miles per hour (8.0 km/h), with the average daily mileage covered being around 60 to 70 miles (97 to 113 km). 'Stage' originally referred to the distance between stage stations on a route but through metonymy it came to be applied to the stagecoach. The first crude depiction of a coach was in an English manuscript from the 13th century. The first recorded stagecoach route started in 1610 and ran from Edinburgh to Leith. This was followed by a steady proliferation of other routes around the island. By the mid 17th century, a basic stagecoach infrastructure had been put in place. A string of coaching inns operated as stopping points for travellers on the route between London and Liverpool. The stagecoach would depart every Monday and Thursday and took roughly ten days to make the journey during the summer months. Stagecoaches also became widely adopted for travel in and around London by mid-century and generally travelled at a few miles per hour. Shakespeare's first plays were performed at coaching inns such as The George Inn, Southwark. Whoever is desirous of going between London and York or York and London, Let them Repair to the Black Swan in Holboorn, or the Black Swan in Coney Street, York, where they will be conveyed in a Stage Coach (If God permits), which starts every Thursday at Five in the morning. The speed of travel remained constant until the mid-18th century. Reforms of the turnpike trusts, new methods of road building and the improved construction of coaches led to a sustained rise in the comfort and speed of the average journey - from an average journey length of 2 days for the Cambridge-London route in 1750 to a length of under 7 hours in 1820. Robert Hooke helped in the construction of some of the first spring-suspended coaches in the 1660s and spoked wheels with iron rim brakes were introduced, improving the characteristics of the coach. In 1754, a Manchester-based company began a new service called the "Flying Coach". It was advertised with the following announcement - "However incredible it may appear, this coach will actually (barring accidents) arrive in London in four days and a half after leaving Manchester." A similar service was begun from Liverpool three years later, using coaches with steel spring suspension. This coach took an unprecedented three days to reach London with an average speed of eight miles per hour. Even more dramatic improvements were made by John Palmer at the British Post Office. The postal delivery service in Britain had existed in the same form for about 150 years—from its introduction in 1635, mounted carriers had ridden between "posts" where the postmaster would remove the letters for the local area before handing the remaining letters and any additions to the next rider. The riders were frequent targets for robbers, and the system was inefficient. Palmer made much use of the "flying" stagecoach services between cities in the course of his business, and noted that it seemed far more efficient than the system of mail delivery then in operation. His travel from Bath to London took a single day to the mail's three days. It occurred to him that this stagecoach service could be developed into a national mail delivery service, so in 1782 he suggested to the Post Office in London that they take up the idea. He met resistance from officials who believed that the existing system could not be improved, but eventually the Chancellor of the Exchequer, William Pitt, allowed him to carry out an experimental run between Bristol and London. Under the old system the journey had taken up to 38 hours. The stagecoach, funded by Palmer, left Bristol at 4 pm on 2 August 1784 and arrived in London just 16 hours later. Impressed by the trial run, Pitt authorised the creation of new routes. Within the month the service had been extended from London to Norwich, Nottingham, Liverpool and Manchester, and by the end of 1785 services to the following major towns and cities of England and Wales had also been linked: Leeds, Dover, Portsmouth, Poole, Exeter, Gloucester, Worcester, Holyhead and Carlisle. A service to Edinburgh was added the next year, and Palmer was rewarded by being made Surveyor and Comptroller General of the Post Office. By 1797 there were forty-two routes. The period from 1800 to 1830 saw great improvements in the design of coaches, notably by John Besant in 1792 and 1795. His coach had a greatly improved turning capacity and braking system, and a novel feature that prevented the wheels from falling off while the coach was in motion. Besant, with his partner John Vidler, enjoyed a monopoly on the supply of stagecoaches to the Royal Mail and a virtual monopoly on their upkeep and servicing for the following few decades. Steel springs had been used in suspensions for vehicles since 1695. Coachbuilder Obadiah Elliott obtained a patent covering the use of elliptic springs - which were not his invention. His patent lasted 14 years delaying development because Elliott allowed no others to license and use his patent. Elliott mounted each wheel with two durable elliptic steel leaf springs on each side and the body of the carriage was fixed directly to the springs attached to the axles. After the expiry of his patent most British horse carriages were equipped with elliptic springs; wooden springs in the case of light one-horse vehicles to avoid taxation, and steel springs in larger vehicles. 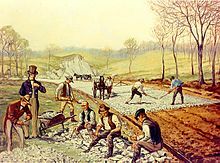 Construction of a macadamized road in the United States (1823). These roads allowed stagecoaches to travel at much greater speeds. Steady improvements in road construction were also made at this time, most importantly the widespread implementation of Macadam roads up and down the country. The speed of coaches in this period rose from around 6 miles per hour (including stops for provisioning) to 8 miles per hour and greatly increased the level of mobility in the country, both for people and for mail. Each route had an average of four coaches operating on it at one time - two for both directions and a further two spares in case of a breakdown en route. Joseph Ballard described the stagecoach service between Manchester and Liverpool in 1815 as having price competition between coaches, with timely service and clean accommodations at inns. Gentlemen ordered out of the coach to lighten the load on the horses. Three put their shoulders to the back. The development of railways in the 1830s spelled the end for stagecoaches and mail coaches. The first rail delivery between Liverpool and Manchester took place on 11 November 1830. By the early 1840s most London-based coaches had been withdrawn from service. Some stagecoaches remained in use for commercial or recreational purposes. They came to be known as road coaches and were used by their enterprising (or nostalgic) owners to provide scheduled passenger services where rail had not yet reached and also on certain routes at certain times of the year for the pleasure of an (often amateur) coachman and his daring passengers. While stagecoaches vanished as rail penetrated the countryside the 1860s did see the start of a coaching revival spurred on by the popularity of Four-in-hand driving as a sporting pursuit (the Four-In-Hand Driving Club was founded in 1856 and the Coaching Club in 1871). New coaches often known as Park Drags began to be built to order. Some owners would parade their vehicles and magnificently dressed passengers in fashionable locations. Other owners would take more enthusiastic suitably-dressed passengers and indulge in competitive driving. Very similar in design to stagecoaches their vehicles were lighter and sportier. These owners were (often very expert) amateur gentlemen-coachmen, occasionally gentlewomen. [note 1] A professional coachman might accompany them to avert disaster. Professionals called these vehicles 'butterflies'. They only appeared in summer. The diligence (dilly for short), a solidly built coach with four or more horses, was the French analogue for public conveyance, especially in France, with minor varieties in Germany such as the Stellwagen and Eilwagen. The diligence from Le Havre to Paris was described by a fastidious English visitor of 1803 with a thoroughness that distinguished it from its English contemporary, the stage coach. A more uncouth clumsy machine can scarcely be imagined. In the front is a cabriolet fixed to the body of the coach, for the accommodation of three passengers, who are protected from the rain above, by the projecting roof of the coach, and in front by two heavy curtains of leather, well oiled, and smelling somewhat offensively, fastened to the roof. The inside, which is capacious, and lofty, and will hold six people in great comfort is lined with leather padded, and surrounded with little pockets, in which travellers deposit their bread, snuff, night caps, and pocket handkerchiefs, which generally enjoy each others company, in the same delicate depository. From the roof depends a large net work which is generally crouded with hats, swords, and band boxes, the whole is convenient, and when all parties are seated and arranged, the accommodations are by no means unpleasant. Upon the roof, on the outside, is the imperial, which is generally filled with six or seven persons more, and a heap of luggage, which latter also occupies the basket, and generally presents a pile, half as high again as the coach, which is secured by ropes and chains, tightened by a large iron windlass, which also constitutes another appendage of this moving mass. The body of the carriage rests upon large thongs of leather, fastened to heavy blocks of wood, instead of springs, and the whole is drawn by seven horses. The English visitor noted the small, sturdy Norman horses "running away with our cumbrous machine, at the rate of six or seven miles an hour." At this speed stagecoaches could compete with canal boats, but they were rendered obsolete in Europe wherever the rail network expanded in the 19th century. Where the rail network did not reach, the diligence was not fully superseded until the arrival of the autobus. 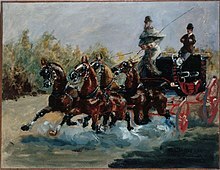 In France, between 1765 and 1780, the turgotines, big mail coaches named for their originator, Louis XVI's economist minister Turgot, and improved roads, where a coach could travel at full gallop across levels, combined with more staging posts at shorter intervals, cut the time required to travel across the country sometimes by half. Beginning in the 18th century crude wagons began to be used to carry passengers between cities and towns, first within New England by 1744, then between New York and Philadelphia by 1756. Travel time was reduced on this later run from three days to two in 1766 with an improved coach called the Flying Machine. The first mail coaches appeared in the later 18th century carrying passengers and the mails, replacing the earlier post riders on the main roads. Coachmen carried letters, packages, and money, often transacting business or delivering messages for their customers. By 1829 Boston was the hub of 77 stagecoach lines; by 1832 there were 106. Coaches with iron or steel springs were uncomfortable and had short useful lives. Two men in Concord, New Hampshire developed what became a popular solution. They built their first Concord stagecoach in 1827 employing long leather straps under their stagecoaches which gave a swinging motion. That day's stage ride will always live in my memory – but not for its beauty spots. Jammed like sardines on the hard seats of an old time leather spring coach – a Concord – leaving Pantano, creeping much of the way, letting the horses walk, through miles of alkali dust that the wheels rolled up in thick clouds of which we received the full benefit ... It is always a mystery to the passenger how many can be wedged into and on top of a stagecoach. If it had not been for the long stretches when the horses had to walk, enabling most of us to get out and "foot it" as a relaxation, it seems as if we could never have survived the trip. The horses were changed three times on the 80-mile (130 km) trip, normally completed in 17 hours. and whistles her sweet diuretic strains. May drive six harnessed monarchs, if they please. Leap, swim, shoot flying, and pronounce on wit. ^ Holmes, Oliver Wendell; Rohrbach, Peter T. (1983). Stagecoach East: Stagecoach Days in the East from the Colonial Period to the Civil War. Smithsonian Institution Press. p. 220. ISBN 978-0-87474-522-1. ^ "Yard-of-ale glass (drinking glass)". Britannica Online Encyclopedia. Encyclopædia Britannica, Inc. 20 July 1998. Archived from the original on 4 June 2011. Retrieved 10 March 2010. ^ "The Yard of Ale : Our History". www.theyardofale.com. 2008. Archived from the original on 4 March 2010. Retrieved 10 March 2010. ^ Olmert, Michael (1996). Milton's Teeth and Ovid's Umbrella: Curiouser & Curiouser Adventures in History, p.142. Simon & Fille, New York. ISBN 0-684-80164-7. ^ a b c M. G. Lay (1992). Ways of the World: A History of the World's Roads and of the Vehicles That Used Them. Rutgers University Press. p. 125. ISBN 9780813526911. ^ "History of transport and travel". ^ a b c "Coaching History". ^ a b c d "The Mail Coach Service" (PDF). The British Postal Museum & Archive. 2005. Archived from the original (PDF) on 2011-01-02. Retrieved 21 July 2008. ^ Paul Ailey (2004). "Mail Coaches". Bishops Stortford Tourist Information. Retrieved 21 July 2008. ^ Adams, William Bridges (1837). English Pleasure Carriages. London: Charles Knight & Co.
^ Joseph Ballard (1913). England in 1815 as Seen by a Young Boston Merchant. Boston & New York. The stage fare from Manchester to Liverpool, distance forty miles, is only six shillings. This is caused by the strong opposition, as there are eight or ten coaches continually running between those places. Besides the fare in the coach you have to pay the coachman one shilling per stage of about thirty miles, and the same to the guard whose business it is to take care of the luggage, &c. &c. Should the passenger refuse to pay the accustomed tribute he would inevitably be insulted. You must pay also, at the inns, the chambermaid sixpence a night, the "boots" (the person who cleans them) two pence a day, and the head waiter one shilling a day. The porter who takes your portmanteau up stairs moves his hat with "pray remember the porter, Sir." The beds at the inns are surprisingly neat and clean. In many of the inns in a large town, the chambermaids furnish the chambers and depend upon their fees for remuneration. The stagecoaches are very convenient and easy. No baggage is permitted to be taken inside, it being stowed away in the boot places before and behind the carriage for that purpose. Here it rides perfectly safe, not being liable to be rubbed, as they ride upon the same springs that the passengers do. A person can always calculate upon being at the place he takes the coach for (barring accidents) at a certain time, as the coachman is allowed a given time to go his stage. The guard always has a chronometer with him (locked up so that he cannot move the hands) as a guide with regard to time. ^ One of the horses was ridden by the postilion. John Carr, The Stranger in France, or, A tour from Devonshire to Paris London 1803:32. ^ Moody, Ralph (1998). Stagecoach West. Bison Books-University of Nebraska Press. p. 13. ISBN 978-0-8032-8245-2. 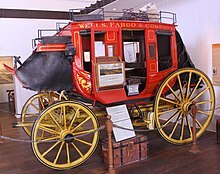 Wikimedia Commons has media related to Stagecoach. The Stage Coaches of Britain. Anvil. Text based on Stagecoach by John Richards (1976). Cobb & Co Heritage Trail. This page was last edited on 2 April 2019, at 05:44 (UTC).